By the courtesy of Ogingo Videography, Sabah, Malaysia. Please note that you can download the video clips onto your own computer and view them at your leisure. Enter the web page (not this one) where the selected video clip can be downloaded. Place your computer pointer at the picture or one of the links, and right click. Choose “Save Target As”. Select the directory or sub-directory where you wish to keep the video clip. Click “Save”. In Shaolin Wahnam we always practice kungfu as chi kung and meditation. Participants enter Zen and perform"Lifting the Sky". Notice that in his chi flow Daniel bounces himself off the wall without any injury. Then the participants learn basic stances and footwork, and some basic Shaolin patterns. Next they link the patterns into sequences. The size of the video clip is 2.96 MB. The 16 combat sequences which form the basic Shaolin combat training in our school are demonstrated. They cover all the four categories of attack, namely striking, kicking, felling and gripping. The size of the video clip is 3.98 MB. Overview 3: Are They performing Kungfu Dance? Participants learn the various sets formed from the combat sequences. They they progress from controlled sparring to free sparring, after which they go into free flow which may look like some interesting dance (but is not). The size of the video clip is 4.55 MB. Many people say that the basics are very important in kungfu training, but not many know what actually these basics are. They mistakenly think that practicing the basics means practicing kungfu sets. In our school, solo set practice is not the basic. They are many things we need to train before solo set practice, and these include entering Zen, chi flow, stances and footwork, flexibility and kicks, fundamental patterns, spacing and timing, and exploding force. Interestingly, some of what we regard as basics, like entering Zen, chi flow and exploding force, are considered advanced by many other kungfu schools and hence are learnt only at the advanced stage of their kungfu training. Some, like spacing and timing, are seldom taught in other kungfu schools. It is a misconception amongst many students that one will win a fight if he has the right techniques. Actually, more important than techniques are the skills in executing the techniques effectively. In our school, right spacing and right timing are amongst the earliest skills we train, for without these fundamental skills our techniques become ineffective even if they are appropriate for the combat situations. The skills we acquire in our combat application can and should be applied rewardingly in our daily living. The low level of sparring today compared to that in the past is obvious even when we only examine how martial artists make their first moves in attack and defence. Not only attackers do not prepare themselves well for advantages, they frequently give away disadvantages of themselves to their opponents — what we call free-offers. As it has been often emphasized, what we learn in our kungfu lessons can be directly transferred to our daily life. The video clips below show how you can avoid your own defeat and create your own victory in making the first movements of attack and defence. In today's free sparring, many martial artists do not realize that they have given away many disadvantages of themselves to their opponents, without their opponents having to do anything. All the opponents have to do is to exploit these free-offers and defeat the attackers. However, their opponents often do not know about these free-offers, and hence cannot exploit them for their advantages. In our combat training, the first principle is to ensure that we are safe. To ensure safety, we do not give away disadvantages to our opponents. Then we should be able to recognize free-offers our opponent may give us and exploit them. If your opponents are well trained, they will not give away free-offers. In this case we have to create our own advantages. This can be realized by employing tactics and strategies. Firstly we ensure we do not give away disadvantages of ourselves to our opponents. Next we exploit the opponent's disadvantages if any. If no advantages are present, we create them. There are various principles and tactics to help us realize these three fundamental steps in combat. Before we attack we must have four modes of preparation. In our defence we ensure right timing and right spacing. The video clips below illustrate some of these combat principles and tactics learnt and practiced at the Intensive Shaolin Kungfu Course in Sabah in March 2007. Why do we spend so much time practicing combat efficiency when fighting is happily not common nowadays? There are a few good reasons. Being combat efficient in our art makes our practice meaningful and gratifying. Fighting may still happen, and being able to defend ourselves is a very useful ability. It gives us tremendous confidence. But the most important reason is that the skills we derive from our training, like quick decision, being relaxed in demanding situations, and being able to make instantaneous changes should a mistake occurs, can be rewardingly used in our daily life. Moreover, sparring in Shaolin Wahnam is not only free from injury but actually full of fun as well as helps to develop our character. If you practice genuine kungfu, amongst many other benefits, you should be free from pain and illness, and have mental clarity even in demanding situations. But, instead, many kungfu practitioners today suffer from internal injuries, and are stressful and angry even at ordinary times. Why is this so? One important reason is that they miss the secrets that enable them to gain these benefits. Our school is noted for sharing secrets. If we want to prevent this genuine kungfu disappearing, we just have to share some secrets. But those who do not believe in these secrets will not benefit, not because they are denied the secrets but because they block themselves from the benefits practicing these secrets will give. We need not be worried that others may use our own secrets against ourselves because these secrets are actually quite elementary. But they are very important. If you neglect them you will miss the essence of kungfu or chi kung. Moving into an opponent effectively requires suitable techniques and appropriate skills. More importantly, you have to ensure you are safe from his counter-attacks. In the process of your attack, as you move in and before you have stabilized yourself is the moment when you are vulnerable to an opponent's counter-attack. Reversely, if an opponent rushes in to attack you, it is relatively easy for you to strike him in surprise, especially if he is not trained in the principle of “safety first” and thus exposes himself carelessly. But not all things are equal. We in Shaolin Wahnam believe that kungfu can be used for fighting. Those who are not connected with kungfu today will find this statement ridiculous. It is as ridiculous as saying that we believe food can be eaten or a swimmer can swim! But the kungfu situation today is really ridiculous. So many kungfu and wushu (which is a Chinese term for kungfu) practitioners do not believe that kungfu can be used for fighting that saying it can be used for fighting is actually in a minority. And to actually use kungfu for sparring or fighting is in a very rare minority. But one can use kungfu for fighting only if he has followed a sparring methodology using kungfu forms. If he only practices kungfu forms in solo, he will fight haphazardly. An essential aspect of our sparring methodology is combat sequences. 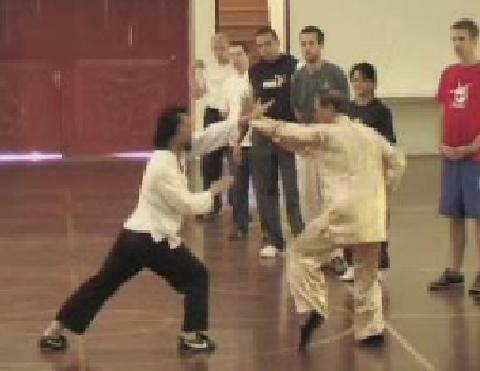 The video clips below show how participants at the Sabah Intensive Shaolin Kungfu Course of March 2007 applied the first four combat sequences in their sparring. Why do many kungfu practitioners who can perform beautiful kungfu patterns in solo abandon their kungfu for free-style fighting, Kick-Boxing or other martial techniques when they spar? The main reason is that they have never been trained to use kungfu techniques in sparring. So when they spar, they are forced to use kungfu patterns haphazardly, instead of in a systematically trained manner. In frustration they would throw away their kungfu forms and fight randomly like their opponent. They would find using kungfu forms a burden, whereas fighting randomly would be more effective. The true reason is not that kungfu forms are ineffective for fighting, but that they have never been trained to use them. The video series below follows from the previous one. It shows you how you can link combat sequences together to enable you to be more effective in sparring or actual fighting. After having developed basic combat skills like correct timing, correct spacing, sound judgment, instantaneous change, and fluid movement, in Combat Sequences 1 to 4, participants progress to Combat Sequences 5 to 8 where they expand the repertoire of their combat techniques. Whereas the left-leg mode is mainly used in the previous four sequences, in the next four sequences the right-leg is mainly used, thus enabling the participants to be proficient with both legs as the leading leg. Sequences 5 to 8 also introduce the tactic of pressing attacks. A famous but little understood tactic to implement pressing attacks is “Continuous Cannons”, shown in the video clips below. Combat sequences help you to overcome two major problems many martial artists face when sparring. A major problem many initiators face is wondering what pattern to use next. When you use a combat sequence, you don't have this problem, you merely execute the sequence. A major problem many responders face is how to use proper kungfu patterns to respond correctly and spontaneously to random attacks. This is indeed a big problem for many martial artists. When they start thinking of what patterns to use, they become hesitant, and soon discover that punches and kicks rain on them. The secret is that in combat you do not think, you just respond spontaneously and correctly. Combat sequences provide you a systematic way to do so. When you have completed one sequence, logically you can continue with another sequence. The video clips below show the mechanics involved in the continuation from one sequence to another. The two lines of a poetic cherished in Shaolin Wahnam are as follows: Marvelous Techniques Beget Marvelous Techniques. Wondrous Skills Generate Wondrous Skills. The video clips below show an example of a marvelous technique, whereby you break your opponent's ribs as soon as he attacks! The counter is even more marvelous. When an opponent applies this technique on you, he may find your snake palm thrusting into his throat at a time when he thinks he has broken your ribs. You will also find the secret of exploding internal force. For the sake of better understanding, kungfu may be classified into four aspects: 1. Form; 2. Force; 3. Application; 4. Philosophy. Due to various reasons, most kungfu practitioners today focus only on forms, neglecting the other aspects. In Shaolin Wahnam we pay attention to all the four aspects of kungfu. Having spent some time on combat application in the previous video series, this series focuses on attaining picture-perfect forms and developing various kinds of force or skills. Kungfu philosophy is found in every series. Many kungfu practitioners today throw away the kungfu patterns they have arduously practiced in solo and spar or fight haphazardly. Some even go to the extent of saying that kungfu techniques cannot be used for fighting! Kungfu techniques, of course, can be used for fighting. Using kungfu techniques in fighting is superior to fighting haphazardly. Form training in solo is an important aspect in kungfu training. In fact, that is what masters normally do. However, most kungfu practitioners today do not realize the meaning or objectives in solo form training. They practice their forms almost solely for demonstration. In genuine, traditional kungfu, solo form training accomplishes the following objectives: performing kungfu techniques in picture-perfect forms; breath control; developing and exploding force; developing correct and spontaneous responses; developing speed and stamina; being fluent in combat sequences; practicing variations in combat; and practicing tactics and strategies. This video series show how participants at the Sabah Intensive Shaolin Kungfu Course of March 2007 accomplish some of these objectives in solo form training. Many people, including kungfu practitioners, mistakenly think that there are no or few kicks in kungfu. Actually there are more kicks in Shaolin Kungfu than all the kicks in other martial arts put together! But kicks contain some innate weaknesses, i.e. weaknesses due to the nature of kicks itself and not due to inadequate skills in applying the kicks. Hence, you need to practice your kicking techniques until you can execute them very well before you attempt to apply them. You should also be familiar with the common counters against the kicks you intend to apply so that should your opponent use these counters, you know how to respond spontaneously. If all other factors were equal, using hand strikes in attack are more advantageous than using kicks. But in real life other factors are not equal. Therefore, there are combat situations where kicks are preferred. Moreover, past masters also developed some useful tactics for kicking attacks. In other words, instead of moving into an opponent straight-away to kick, if you plan some preliminary moves to prepare for favorable situations, your kicks will be more effective. On the other hand, you may tempt him to attack you. As he moves in to attack, you surprise him with a kick. You may allow him to attack you a few times before suddenly counter-attacking. Sparring and actual fighting may operate at the following levels of sophistication: random-level, technique-level, sequence-level, tactic-level, and strategy-level. The progression from random fighting to using techniques to tactics and to strategies represents the development of combat sophistication over many centuries. From their fighting experiences, past masters formulated principles from their applications of techniques, tactics and strategies. We must also remember that when we fight at a higher level of sophistication, it does not necessary mean we will definitely win the combat. An opponent who operates at a low level of sophistication but is very skillful may be victorious. Thirteen Shaolin monks helped the first Tang Emperor to establish his empire. During the imperial celebration, Yuan Zhoong performed a Shaolin set called “Cannon Fist”. The hallmark of this set was “lian zhu bao” or “Continuous Cannons”. “Continuous cannons” is an important tactic in our sparring methodology, and is first introduced in Combat Sequence 5. Uncle Righteousness used it often in his fighting during his young days, but he did not teach it openly. To prevent this great Shaolin tactic from being lost to posterity, and in an unprecedented manner, Grandmaster Wong shares this great secret here, in honour of his teacher, Uncle Righteousness. Not only that, Grandmaster Wong also shares its counters. When we practice an individualized art like Boxing, we benefit from the experience and teaching of our immediate teachers, and sometimes our teachers' teachers. But when we practice an institutionalized art like Shaolin Kungfu, we inherit the experiences and teachings of tens of thousands of masters over many centuries. An institutionalized art has a repertoire that is unfathomable. Comparing the repertoire of an individualized art built by a few masters over a few years with the repertoire of an institutionalized art evolved by tens of thousands of masters over many centuries is like comparing a drop of water with an ocean. The experiences and teachings of tens of thousands of masters were refined and generalized into principles. For example, past masters discovered that if an opponent was much stronger than you, you needed not match his strength with equal strength. You could use his strength to defeat him. All kungfu patterns are named, often poetically and always meaningfully. Some patterns, especially in recent times, are technically named. For example, “Black Tiger Steals Heart”, is also called “Bow-Arrow Thrust Punch”. Poetic patterns can be very deadly. One may think that “Yellow Oriole Plays with Water” is delicate and elegant, which it is, but it is also a deadly double attack at the eye and groin at the same time. This video series shows how you may intercept pressing attacks with “Yellow Oriole Plays with Water”, or, interestingly, continue your pressing attacks with this deadly pattern. The attacks and counters here constitute Combat Sequence 11, which is also named after the poetic pattern. An important tenet, “Moving Back One Step” is also explained. A Shaolin Wahnam kungfu student knows the defence against any attacks. This may sound boastful, but it is true. Nevertheless, this does not mean he can actually defend against any attacks. He may know the defence techniques, but if he lacks the skills he would still be unsuccessful. Attacks can come in countless ways but they can be generalized into four categories, namely striking, kicking, felling and gripping. Each category can further be classified into archetypes. Once you can defend against an archetypical attack and understand its underlying philosophy, you can defend against all other attacks of the same types. This video series shows attacks and counters forming Combat Sequence 12, “Naughty Monkey Kicks at Tree”. It also recapitulates the important principle of “moving back one step when in difficult situationS”, which is very useful in combat as well as in real life. Combat Sequences 9 to 12 are joined together into a set named “Happy Bird Hops up Branch”. This set emphasizes kicking techniques. Four typical kicking attacks are introduced, namely side kick, thrust kick, organ-seeking kick and whirlwind kick. Except for the last kick where it is being intercepted, no-defence-direct-counters are used against the kicking attacks. This video series shows participants at the Sabah Intensive Shaolin Kungfu Course of March 2007 practice the four combat sequences pattern by pattern, as well as how the sequences are linked into a set. Some people have the misconception that there are no throws in kungfu. Throws are only one of a category of techniques to fell opponents to the ground. There are other felling techniques like tripping, pushing and sweeping. But throws and other felling techniques in kungfu are unlike those in Judo and Wrestling. Because Judo and Wrestling are sports, they are protected by safety rules. But there are no safety rules in kungfu. Moreover, size and weight count in Judo and Wrestling, but not in kungfu. All attacks can be generalized into four categories: striking, kicking, felling and gripping. When you can counter these archetypical attacks, you can counter all attacks. Striking is emphasized in Combat Sequences 1 to 8, kicking in Combat Sequences 9 to 12, and felling and gripping in Combat Sequences 13 to 16. When you apply felling techniques you also use gripping attacks. As you neutralize an opponent's felling techniques, you neutralize his grips too. “Double Butterflies Flying Together” and “Hiding Flowers in the Sleeves” are two excellent patterns to counter grips as well as felling attacks. One often thinks of Judo and Wrestling when talking about throws and other felling techniques. But what many people may not realize is that Judo and Wrestling are sports protected by safety rules. As genuine, traditional kungfu is trained for real fighting and not just for sport, a kungfu exponent must always ensure safety first before attempting to execute any felling or other attacks. On the other hand, while we are prepared for an opponent's deadly attacks, we avoid hurting our opponents as best as we can. This is enshrined in the saying “sau ha lau cheng”, which means “let mercy flow from the hand”. Many people think set practice is useless because fighting or even free sparring does not come in a pre-arranged manner like in kungfu set. Thus, they go straight to free sparring. On the other hand, they are many who just perform solo sets all their lives. You know from direct experience that both these extremes are incorrect. Do you know why we practice solo sets? In other words, what benefits can solo set training give us? How are you going to use typical kungfu patterns in free sparring correctly and spontaneously? These are two main problems most kungfu practitioners today face, namely how to use kungfu patterns and not free-style fighting, and how to use them correctly and spontaneously. We in Shaolin Wahnam are very lucky to have a sparring methodology that can overcome these two problems. We have two main methods, namely the “Eight-Stage Approach” and “Subtraction and Addition”. This video series records some of these lessons. “Subtraction and Addition” is an excellent method to enable you progress from combat sequences to free sparring. This can be applied at various levels and with much variation. But basically it involves subtracting or adding one or more patterns from or to planned sequences. At any point your sparring partner may intercept your attack and counter-attack. You would decide whether to break his counter-attack and carry on the initiative, or allow him to attack and respond accordingly. The videos below show the participants at the Sabah Intensive Shaolin Kungfu Course are able to use typical Shaolin patterns correctly and spontaneously in their free sparring. The secret behind this remarkable achievement is “Subtraction and Addition”. Nowadays almost irrespective of what they practice, most martial artists spar like Boxers and Kick-Boxers. Hence, if you wish to be combat-efficient in Shaolin Kungfu, you must be able to apply it against Boxing and Kick-Boxing. There are many attack techniques in kungfu where a Boxer or a Kick-Boxer would not have counters from his art. An excellent strategy is to use a chosen sequence to press in against a Boxer. Against Kick-Boxers, Grandmaster Wong recommended two strategies. One was to press in with a planned sequence after avoiding their kicks. The other was to fell them onto the ground after their kicks. Some attackers use the “shoot” to take down an opponent. This is a famous technique in Wrestling, which is a sport protected by safety rules. In real fights where safety rules do not apply, using a shoot is suicidal. There was some heated argument in our Shaolin Wahnam Discussion Forum on whether kungfu techniques were adequate to counter the shoot. Some shoot-lovers went to the extent of saying that Wrestlers were so tough that even striking their head or eyes would not cause them damage! Such a belief is not only naive but highly dangerous. But what would you do if an opponent attempts to take you down with a shoot? In this video series various counters to the shoot are shown. These counters cover the shoot at various stages of implementation. Muay-Thai fighters are amongst the most feared opponents of many martial artists. One of the most deadly attacks is an upward knee strike to an opponent's chest or head while pulling the opponent down. Many martial artists do not know how to defend against this attack. A beautiful counter against the deadly Muay-Thai knee attack employs the Shaolin pattern “Planting Willow in Front of Tent”. Ad part of an on-going effort to preserve genuine, traditional Shaolin Kungfu, Grandmaster Wong shares this secret which he learned from Grandmaster Ho Fatt Nam in this video series, after he has shared the secret of Uncle Righteousness on Continuous Cannons in another video series. This pattern also incorporates many beautiful Shaolin principles. Many kungfu practitioners find it hard to fight against Boxers because Boxers are fast. But it may come as a big surprise to them that the Boxers' techniques are actually slower than kungfu techniques! Understanding the difference between skills and techniques will make this paradox clear. Although kungfu is technically faster than Boxing, if you are unskilled in fighting, a skillful Boxer can fight faster than you. Grandmaster Wong also explains some effective tactics and strategies. This video series records some of these lessons. Although Boxers are fast, Boxing techniques are actually slower than Shaolin techniques. Moreover, there are effective tactics and strategies which you can apply against Boxers. Boxers are not trained to use kicking, gripping or felling, nor to defend against these attacks. If you plan your tactics and strategies to exploit these weaknesses, you have a better chance in beating a Boxer. Grandmaster Wong teaches Taijiquan practitioners how to transfer their newly learnt chi kung skills into their Taijiquan forms to generate energy flow and develop internal force. Thousands of Taijiquan practitioners have practiced “Single Whip”, but what is the hook for? Why is the left palm placed at the right wrist when performing the pressing forward technique? And what is meant by striking with the back leg? You will find answers in this video series. Do you know that there are many Taijiquan techniques to counter the shoot? And do you know that there are many Taijiquan techniques to fell opponents onto the ground? You can also find the answers in the videos. Would you believe that a master may use just one patter to overwhelm an opponent irrespective of how the opponent attacks or defends? It is fun seeing how this can be done. Grandmaster Wong provides some impromptu examples in this video series using “Double Dragons Play with Pearl” or “White Monkey Presents Fruit”. Sometimes he uses the two patterns in conjunction. Many people think the pattern “Double Dragon Plays with Water” is only decorative without concrete combat functions. It is amazing that Grandmaster Wong demonstrates so many applications with it. Taijiquan is often regarded as a scholar's martial art. It is gentle and graceful, and its patterns are poetically named, like “White Crane Flaps Wings”, “Jade Girl Threads Shuttle” and “Push Open Window to Look at Moon”. But it is highly combat efficient. A Taijiquan exponent needs not be rough and tough, yet he can be powerful and deadly if he wants to, but he usually spares his opponent from injury. The secret of accomplishing this yin-yang harmony of being gentle yet powerful, being elegant yet combat efficient, lies in the cultivation of chi and the application of internal force. The video series here gives some examples of poetically named patterns applied elegantly and effectively in serious combat.